MSRP: At 5 European shops the price ranges from 23.80 to 36.00 euros. At a shop in the UK the price is 18.89 pounds. Hobbylink Japan has it for 3840 yen. The Horch Company designed the all-wheel drive chassis Horch 108 for the specification to the "Schwerer Gelande Einheits-Personenkraftwagen (4x4) in 1937. 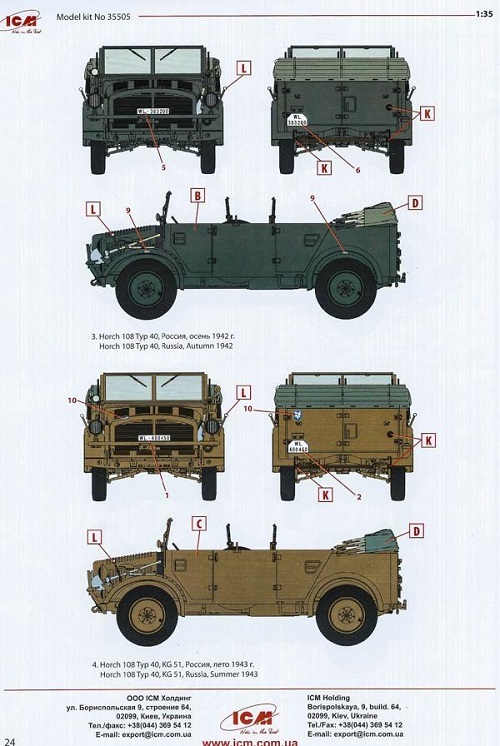 In 1940 they were modified to the typ 40 standard with a spare wheel inside the body. All in all, there were produced 8,135 s.gl.EPkw cars in 1937-1942 by the Horch Company. These vehicles had a good cross-country capability, but were not sufficiently robust or reliable. 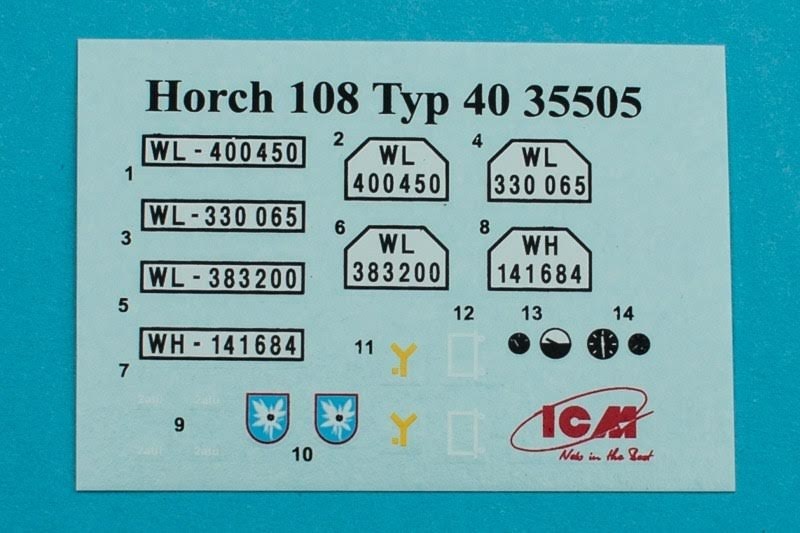 Horch 108 personnel cars were used by all German arms in service on the Soviet-German Front, in North Africa, Italy and France up until the end of the war. ICM is a model company based in Kiev, Ukraine. The box art shows a Horch 108 Typ 40 parked on a grassy runway with a hangar and control tower in the background. It is overall earth-yellow with a license plate number WL-400450. There is unit logo of a blue shield with a white eidelweis flower on it on the left side of the top of the radiator. One side panel has a color 3-view of the box art scheme, followed by the statement that the kit is for adult collectors age 14 and over, in English, French and German. 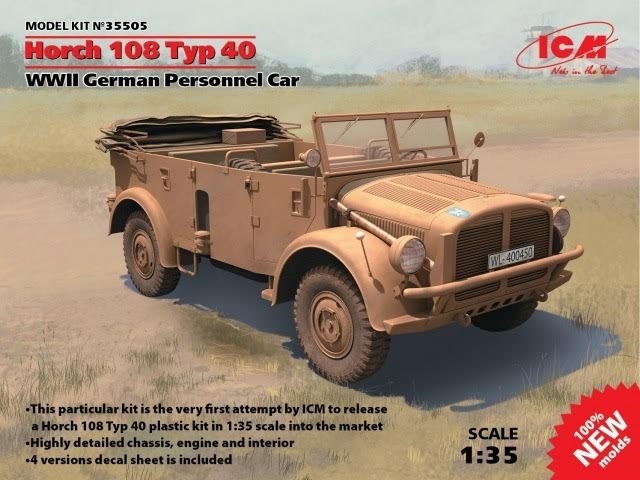 The other side panel has a one paragraph history of the Horch, followed by the statements that the kit contains an unassembled model kit. Its length is 137mm. height 55mm and includes 211 parts. Cement and paint needed to finish model as shown are not included. Instruction sheet with drawings and decal sheet are included. Copyright date is 2015. The kit was made in the Ukraine by ICM Holding. Their street address, telephone and FAX number, e-mail address and web site address are provided. This kit contains 6 tan trees in a large resealable cello bag, a clear tree and a tree of black vinyl tires in resealable cello bags. The clear tree and the tires are inside the bag with the tan parts. The decal sheet (that is loose) and the instructions complete the kits contents. 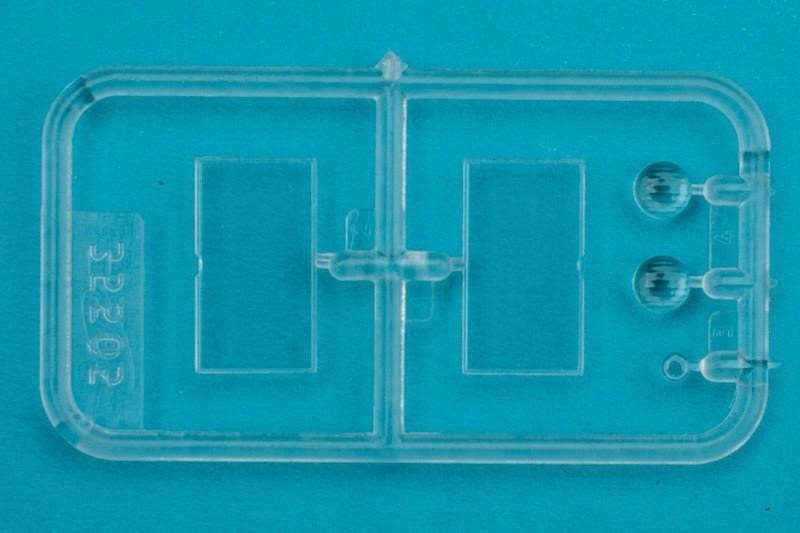 The parts fit the tight box with little or no void. The instructions consist of a staple-bound booklet of 24 pages in 8 1/4" x 11 1/2" page format. The first and last 2 pages are printed on slick coated paper. The rest of the pages are smooth. Page 1 begins with a color repeat of the box art, followed by the history of the car in Ukranian and English, Cautions about the kit, a listing of Model Master brand paints, some assembly symbol explanationsd and ICM's web address in the 2 languages. ICM's web address appears at the bottom of every page in the instructions. Pages 2 and 3 have the parts trees illustrations on them. Page 4 through 22 give a grand total of no less than 73 assembly steps. Probably the MOST I have ever seen in a model kit ! 1. A Horch that is overall schwarzgrau, with a license number WH-141684. a white tactical sign and yellow division symbol are over the license plate on the rear and on the front of the right front fender. This car is with the 8th Panzer Division, Soviet Baltic, Summer 1941. 2. A Horch that is overall schwarzgrau, with a license number WL-330 005. It is with the Luftwaffe (no unit mentioned) Russia, summer 1942. 3. A Horch that is overall schwarzgrau with the license number WL-383200. It also is with the Luftwaffe (no unit mentioned) Russia, Autumn 1942. 4. A Horch that is overall Panzer Dunkelgelb/43 (the box art subject) It has a license number WL-400450 and a division symbol of a blue shield with a white eidelweis flower on it above the rear license plate. There are 2 identical tan letter E1 parts trees. They each hold 5 wheel rims. ​There are 2 identical black vinyl letter E2 parts trees. Each holds 5 tires. 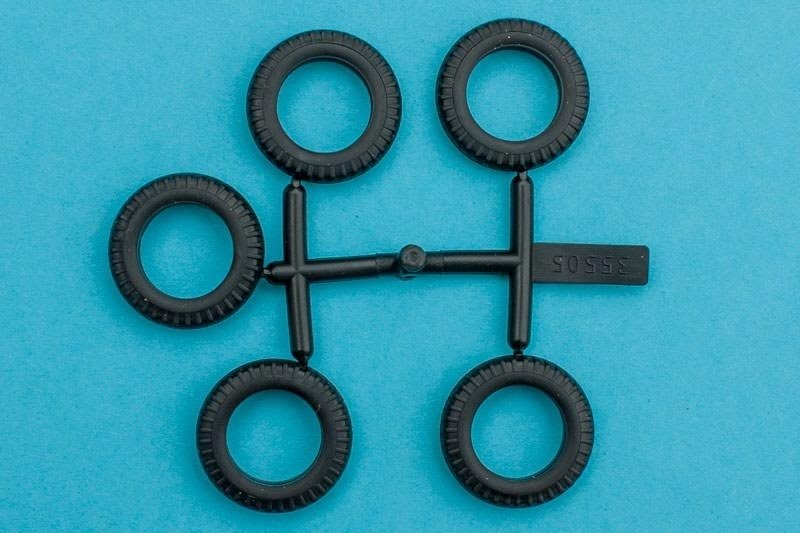 ​The clear letter F parts tree holds 2 windshield panes. 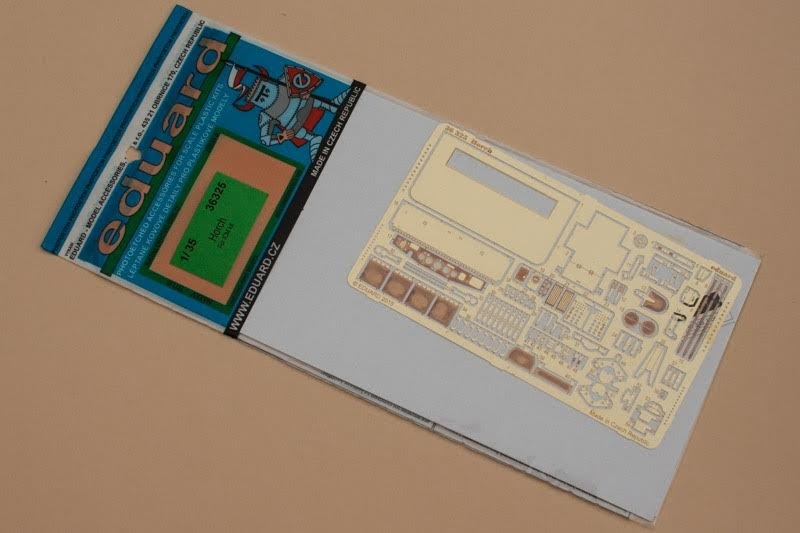 The last item in the kit is the decal sheet for the versions described above. 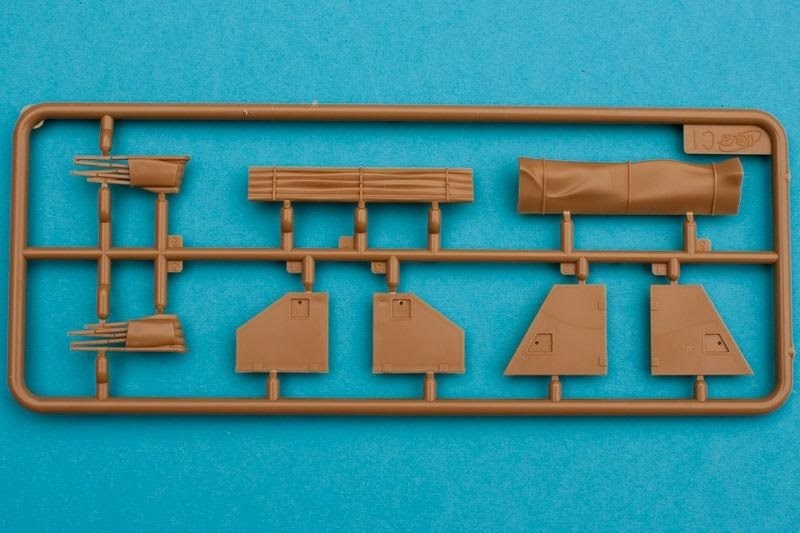 ​This is a very complicated kit with all the many suspension and under-carriage parts and engine. I don't recommend it to the novice modeler and it is not a weekend build project by any stretch of the imagination. Otherwise a greatly detailed model. I only wish there were some figures in the kit. 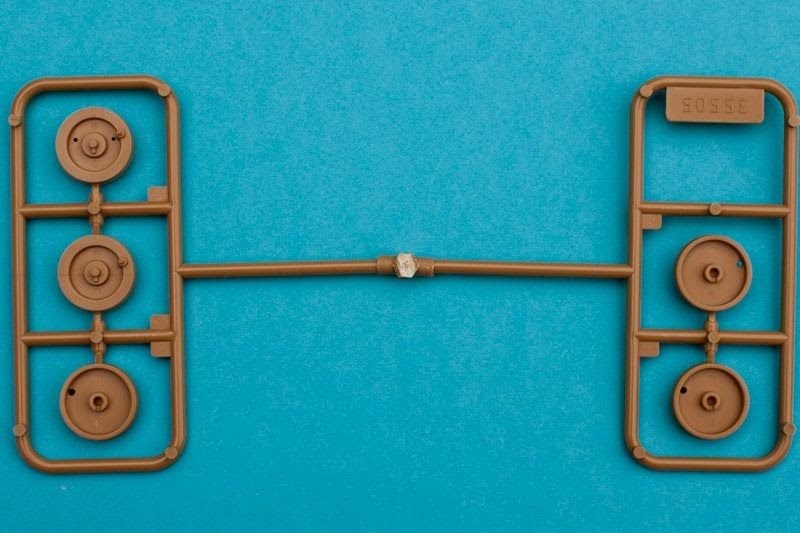 Eduard makes a brass PE set for this kit that would enhance it further.